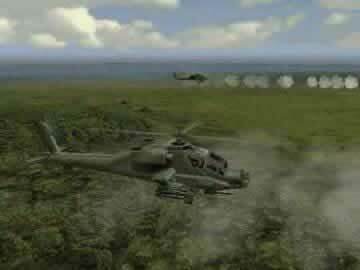 Apache AH-64 Air Assault Game - Download and Play Free Version! The coffee is brewing, it's 4AM and you hear the sound of the computer starting up. You're at it again! Having nightmares, you can't sleep and must play this terribly addicting war game. Of course it is this game that is the source of your night tremors, but that doesn't stop you from wanting to play it. 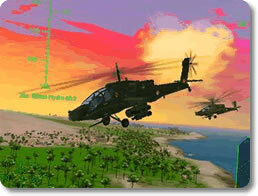 In Apache AH 64, you are in control of the world's most powerful and exciting war machine! 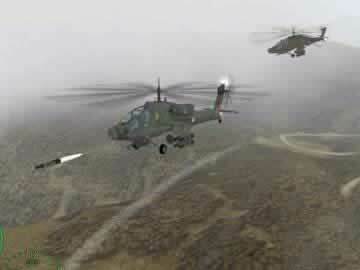 This helicopter can take whatever your enemy throws at it (There are tons of enemies to fight in this game too). Death is in the air and destruction is crying from the streets. You have caused havoc and now you must continue to fight or be wiped out yourself! The Apache AH 64 is the US military's most trusted military machine and it is your turn to pilot this beast to the heart of hostile territories. The fighting may cause you nightmares, but there is always another battle to fight if you are having trouble sleeping! Player created video showing rocket attacks on an enemy camp.